Eastern Coyote Trapping by Austin Passamonte. Learn how to understand, locate, and catch eastern coyotes. Paperback. 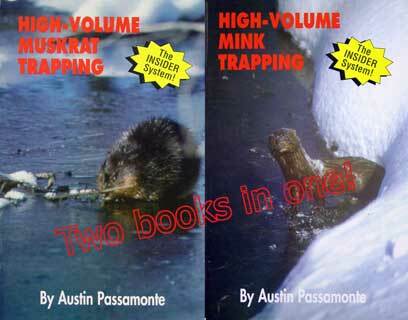 High Competition Beaver Trapping by Austin Passamonte. Shows you sets the competitoin doesn't know, and also how to take educated beaver. Paperback, 86 pages. High Volume Fox Trapping by Austin Passamonte. Great fox book covering fox biology, equipment, and sets. Deals with tough weather situations. Many great pictures. Paperback.